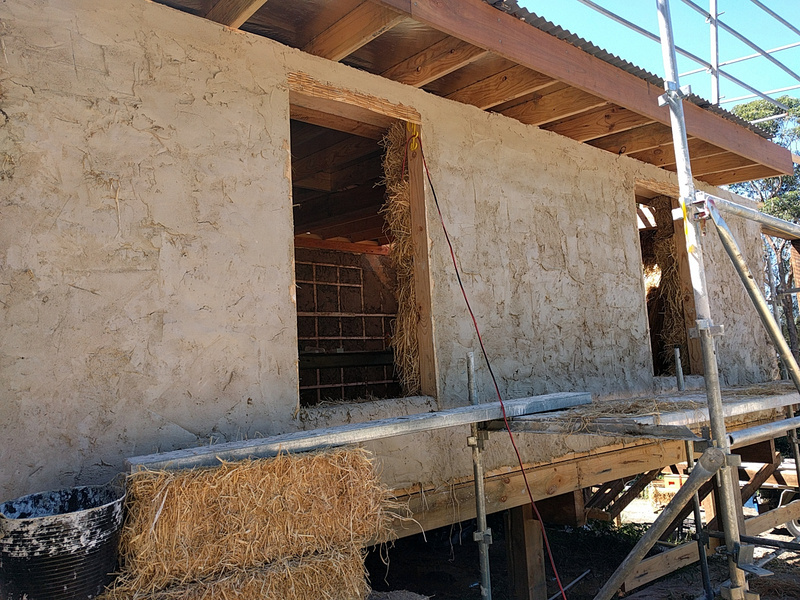 Day three of building a straw bale house with natural materials and I’m starting to get comfortable with the process. 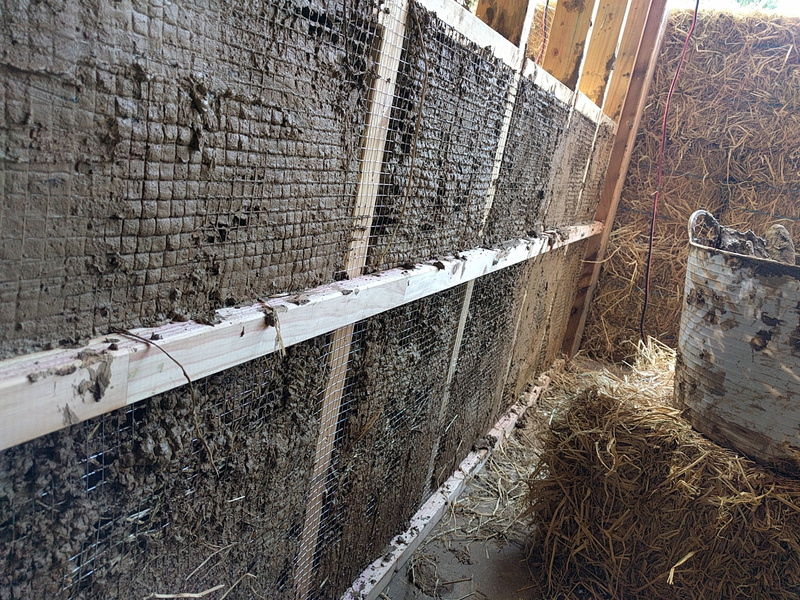 I spend most of my day today on the interior mud walls, just like yesterday. We tried a different technique by forming mud-straw-sand-balls in our hands and ‘staging’ them into the timber frame. This technique has some similarity with mud bricks. The difference was that we didn’t let ours dry out before we put them into the wall. The advantage of these mud-straw-sand-balls was that they were much drier than the mud on its own. We could put them into small compartments in the timber frame without the chicken wire. The disadvantage was that it took much longer and it required about three people to work on one compartment. But it was all about experience for us today and not about speed. 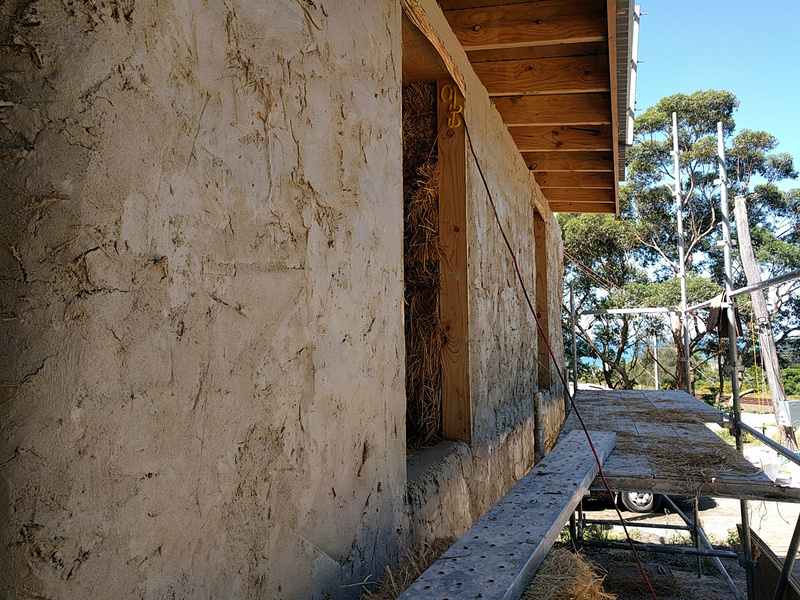 The latest addition to the house – other than a few more mud walls inside – is the render on the outside straw walls. After all clipping and trimming of the walls was complete we started applying the lime render. First, the mixing of the render: sand, cement, hydrated lime, and water went into the mixer and after some (supervised) mixing we poured it into wheelbarrows. Then, the rendering could begin. I have to admit that it wasn’t my favourite job today because getting the render stick to the straw is not straight forward. We were told that the first coat is the most difficult and I can’t argue with that. It felt to me like more render landed on the ground and on my shoes than stuck to the wall. Luckily it was all about labour division. Others had more fun and finished the first coat on almost all four walls before we went home. Our team work and distribution of jobs went extremely smoothly again today. There was time to watch and learn from each other and there was mutual understanding about jobs to be done and people’s preferences. I’m particularly amazed at how steep my learning curve has been over the last few days. I had never before participated in building a house. 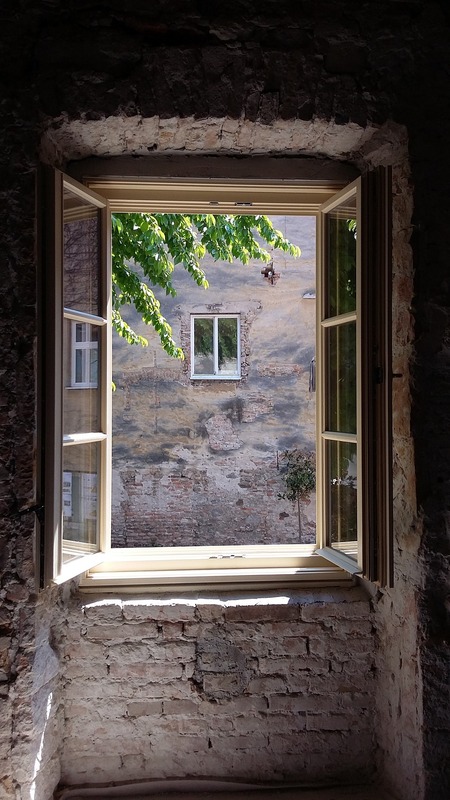 When I started the workshop I had a good amount of respect for everything that is going on on a building side. I maintain that respect but I also know now how much ‘wiggle’ and ‘jiggle’ goes into building a house. Learning from others with different backgrounds has been a big part in that. Seeing the house with a wall-like exterior has meant an amazing transformation from the bare timber frame two days ago. Tomorrow’s job will be to render the inside walls. It will mean more mud and I hope less dirty shoes at the end of the day. 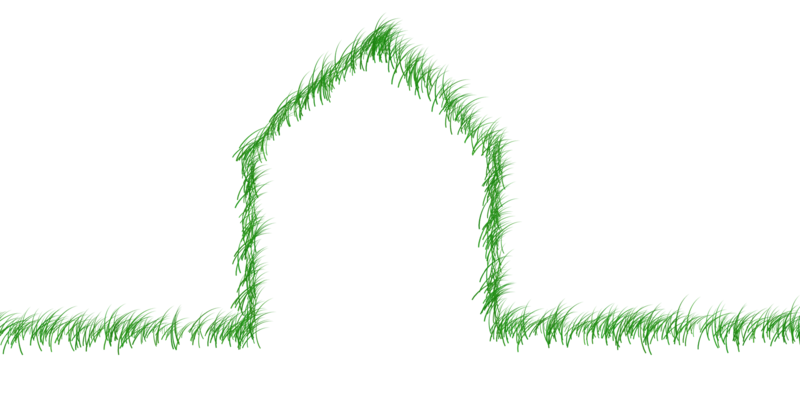 What is a sustainable house?